East Coasters and Floridians rejoice -- you will apparently no longer need to travel across the country to experience the wonder of LEGOLAND. Merlin Entertainments announced Thursday that it will be opening LEGOLAND Florida at the site of the former Cypress Gardens theme park in Winter Haven, Florida. 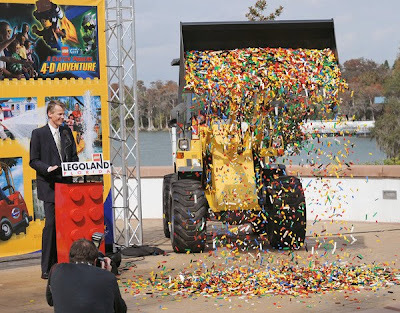 The announcement came with a coup de grace -- 100,000 LEGO bricks were dumped next to the podium from a bulldozer. The new park will have between 40 and 50 attractions with some elements of Cypress Gardens remaining (such as the historic gardens which includes a massive Banyan tree planted in 1939) at the park in Central Florida. The idea of integrating LEGO sculptures with a traditional garden could make for some very interesting Miniland features or park surprises. No word yet on the fate of the Southern Belles -- the greeters to the garden that were a nod to the antebellum South -- or the attached water park. LEGOLAND Florida is expected to open in 2011. Image via the Orlando Sentinel.